It’s not only youngsters who are worth mentioning in the Nigeria Premier League. 25-year old Cameroonian midfielder Medrano Tamen from Sunshine Stars FC has been one of the revelations of the current season. Personally, I think he has a lot of qualities that mid-level European clubs could be interested in. The history of Medrano Tamen is basically the story of a beach football player who broke through in association football. In 2006, Tamen was part of a team called PMUC Sporting Club, associated with a horse betting company called “Pari Mutuel Urbain Camerounais”. As far as I have understood, PMUC sponsored the Cameroon national beach soccer team at the time and Tamen was one of the key players. In November 2006, Tamen played for Cameroon in the FIFA Beach Soccer World Cup in Rio de Janeiro, Brazil. In July 2007, Tamen participated in the beach football version of the Africa Cup of Nations. It is somewhat unclear to me when Tamen started to focus on association football but Tamen won the MTN Elite One 2007-2008 with his new club Cotonsport FC. Tamen was primarily a fringe player and scored one league goal during the season. Tamen joined Mount Cameroon FC for the MTN Elite One 2008-2009 and had a positive season for the struggling club who eventually was relegated. Tamen showed goal scoring abilities and had four league goals to his name. Tamen did not want to play at second level and joined the 2008-2009 champions Tiko United FC before the MTN Elite One 2009-2010. Tamen became a key player for the club that eventually won the bronze medals. I have no information about the number of goals scored by Tamen in 2009-2010. The third place qualified Tiko United FC for the 2011 CAF Confederations Cup, which is very important for a team that rarely gets headlines in Cameroonian media. On 20.03.2011 and 03.04.2011, Tiko United met Sunshine Stars FC, the Nigerian top club, in the first round of the tournament. Although Sunshine Stars FC won both matches, Tamen was impressive and caught the eye of the Nigerian officials. In May 2011, Tamen was brought to Nigeria and Sunshine Stars FC, just another example of how important it is for ambitious African players to play in the tournaments organized by the Confederations of African Football. Before the transfer, Tamen had been a key player for Tiko United FC during the MTN Elite One 2010-2011. I believe Tamen scored one league goal before leaving Cameroon. 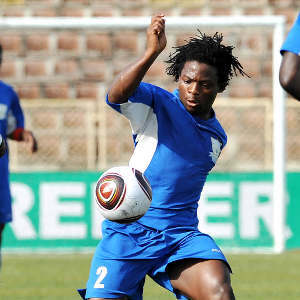 Tamen made his debut in the Nigeria Premier League on 15.05.2011. He has been an instant success at the current league leaders. Tamen has already two league goals to his name. Tamen has been described as a “box-to-box” midfielder by Nigerian journalists. He is a very dynamic, creative all-round central midfielder with an impressive work ethic. Beach football emphasizes skill, agility and shooting and Tamen has learned to use these abilities effectively – also in association football. Tamen has already become a fans favorite at his new club and earned praise from Sunshine coach Gbenga Ogunbote as well as from local media. It’s not often a foreign import understands the Nigerian way of football as quick as Tamen has. Tamen is born 29.03.1986 and has still not reached the peak of his career. He is a rather petit player, 164 centimeters according to his Wikipedia-article. There are several petit African midfielders playing in Europe and I personally think signing Tamen could be a stroke of genius for any club willing to give this player a chance. His full name is “Josue Medrano Ngathie Tamen”. He uses the name “Medrano Ngathie” on his Facebook profile. The picture is taken from SuperSport.